People often have long-term personal goals regarding health behavior change. Recently, the processes for achieving these goals have begun to be supported through behavior change support systems and especially through their persuasive software features. In a multidisciplinary research project focused on helping micro-entrepreneurs to recover from work-related strain and stress, a persuasive mobile application was developed. For gaining insights about the workings of the system and its persuasive features, we conducted 29 interviews with the system users. We used thematic analysis method with a deductive emphasis for analyzing the interviews. For some, concurrent usage of wearables or other applications led to discarding our application. Users thought that the application was relatively persuasive, but technical issues reduced its persuasiveness noticeably. When functioning properly, self-monitoring and reminders were found to be supportive for users to achieve their goals. 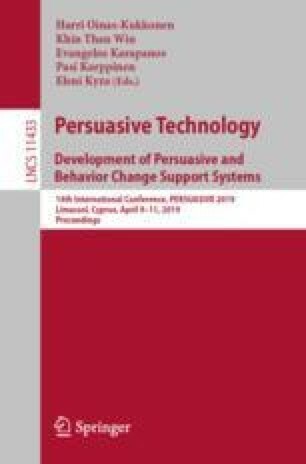 Unobtrusiveness was found to increase the persuasiveness of reminders, while self-monitoring always seems to be dependent on the user’s personal needs. We wish to thank our colleagues at Promo@Work research project, funded by the Strategic Research Council at the Academy of Finland, contract no. 303430 (Finnish Institute of Occupational Health) and contract no. 303431 (University of Oulu, OASIS).